The Bahamian insurance industry is enjoying a resurgence of sorts. The domestic industry is vibrant and diverse and efforts are ongoing to tap the external market through international life insurance and captives. With the domestic insurance industry alone being worth an estimated $757 million, the Bahamian insurance sector is a vital pillar of the financial services offering of the jurisdiction. The industry got its start around the turn of the 19th century when companies such as Imperial Life Assurance Co and J S Johnson & Co Ltd established agencies in The Bahamas. Development on the general insurance side was spurred on by the passage of the Road Traffic Act, 1958, which made motor insurance compulsory. Growth continued with little regulatory oversight until the passage of the Insurance Act in 1969 which laid down minimum standards for those operating in the local insurance industry and introduced a tax on the premium income of insurers. The market operated under the Insurance Act, 1969, until passage of the 2010 Act, 40 years later. The local industry had advocated for years, without success, to have the old act updated because it was not responsive to today’s business environment. The Act of 1969 was unwieldy to administer and effectively handcuffed the regulator making it difficult for him/her to act quickly and decisively, which many feel contributed to the downfall of CLICO Bahamas in 2009. The new act substantially increased the regulator’s powers and set higher minimum standards for companies, making future failures far less likely. The face of the local insurance industry has changed from being dominated by expatriate companies, as it was in the 1980s and early 90s, to being populated by Bahamian insurance companies. The industry is now largely mature with most of the local insurance companies having been around for more than 20 years and many of the intermediaries for significantly longer than that. These firms are generally well managed with a focus on protecting their policyholders and shareholders’ interests. Despite its maturity, the industry continues to grow. Caribbean insurance companies have operated in the local market for several decades, however, recently, more of them have entered the market, spurred mainly by the hard currency available and growth prospects. Because the demand for insurance has not grown at the same rate as the supply, it has led to a softening of rates as more players vie for market share. With investment returns at low levels worldwide, the global reinsurance industry has seen an inflow of capital through new entrants and mergers and acquisitions. This oversupply of reinsurance has helped to soften rates leading to thinner margins for local insurers as original rates charged to clients have also declined. At the same time, insurers are earning less on liquid investments held in their portfolios. This puts a heavy demand on them to make an underwriting profit and not rely on investment income. • basing estimates on the costs in the public health system does not give a true picture of the cost of healthcare in this country. • private sector entities are more efficient than the government at managing healthcare programmes and thus can better contain the costs being passed on to taxpayers. • nationalizing the industry could lead to significant job redundancies, at a time when unemployment is already high. • having just implemented value added tax, the application of another tax in an environment where the economy is not growing could push the economy back into recession. Consumer expectations are changing in line with a digital world. They are now accustomed to online retail as a way of doing business. The local insurance industry must now face this change as more and more consumers demand online services such as policy application, claims assessment and settlement and premium payment options. The challenge for all insurers and intermediaries is to be aware of, and keep pace with, these new expectations in order to maintain customer satisfaction. The Millennials now make up a viable market segment, many of whom who prefer not to engage in face-to-face service interaction. Life insurers, for example, are seeing that this customer class, who lives almost exclusively in a technology-based world, is more concerned about living benefits than death benefits. As a result, life and health insurers must look for ways to incorporate programmes and product features that appeal to that generation by shifting their focus to health and wellness initiatives through social media and similar platforms. Insurance is a major industry in the financial services sector and a significant contributor in terms of employment and revenue. As some of the other local industries have shrunk or been under threat from external sources recently, the insurance industry remains fairly strong and has even shown minimal growth in a difficult economy. According to a report from the Insurance Commission of The Bahamas (ICB), during 2014, the assets of the insurance industry grew by 6.3 per cent to $1,661.5 million, whilst the net equity of insurers doing business locally grew from $440 million to $498 million. The industry employs over 1,300 persons and contributes to the gross national product through the payment of premium tax and other government fees. ICB’s report notes that in 2014, the total number of persons employed in the industry grew by 0.7 per cent to 1,394 and salaries, excluding bonuses, increased by 1 per cent to $47.1 million. During this same period fees paid to government totalled $37.1 million. In the early 1970s, The Bahamas was a world leader in the offshore captive business. However, new legislation introduced during that time proved to be unfavourable to the captive companies, the majority of which moved their business. In recent years, there has been a determined effort by the Bahamas Financial Services Board (BFSB) and ICB to rebuild this sector of our economy. Specifically, The Bahamas is looking to leverage its wealth management industry and mine the considerable client base and distribution network. Companies are always looking for opportunities for growth. With the development of technology came the associated risks that have given insurers a new opportunity to capitalize on with the introduction of cyber insurance. Local insurers and intermediaries are now promoting this product by sensitizing their clients to technology and Internet-based risks. In addition to expansion of product lines, local companies are moving into new regions. Several Bahamian insurers have bought interests in foreign entities, mainly in the Caribbean, allowing them to diversify their portfolio by writing offshore risks. With increased competition, it is likely that more local companies will be looking at global opportunities. The external insurance market will continue to be an area open to significant growth as The Bahamas promotes the advantages of its jurisdiction which include: low capitalization requirements, low regulatory fees, mature financial service industry and tax-neutral environment for business. The future of the local insurance industry in The Bahamas is strong with most companies expected to remain profitable despite a struggling economy. This gives clients peace of mind in knowing that their claims can be met. Despite the stability of the industry, there is some uncertainty as the industry prepares to face the challenges on the horizon. The domestic industry will see more robust regulatory requirements with the regulator’s recent move to a risk-based supervision regime. This will mean increased desk-based reviews and on-site examinations, closer monitoring of statutory reporting and stricter compliance obligations for companies. With the local insurance market being fairly saturated with insurers and intermediaries, it is unlikely that there will be any significant increase in the number of players in the market. This highly competitive environment will likely continue to push insurance rates down on the property and casualty (P&C) side forcing companies to look for ways to reduce costs. The external industry will be buffeted by the usual forces that seek to do away with perceived tax-efficient jurisdictions as well as existing players who do not wish to see their market share eroded. To succeed, The Bahamas will have to find its niche and pursue it aggressively. We will also have to streamline and improve our methodology for compliance with licencing and regulatory requirements to create greater ease of doing business. Our challenge is also to get more Bahamians involved in the external insurance area and to see the benefits of investing in this sector. Now that technology has become the way of the world, local insurance firms will have to find ways to use the digital environment, particularly social media, to personalize their product offerings and customers’ experiences. Firms will have to be innovative in developing and utilizing technology features such as mobile apps and other software that give their clients the freedom and flexibility to choose how and when they do business with their insurance company/intermediary. The Insurance Institute of The Bahamas (IIB) is an organization for persons working in the local insurance sector. IIB’s mandate is to promote insurance education and professionalism in the industry. The association achieves this by providing opportunities for educational development mainly through luncheon lectures, education-based competitions and presentations to schools and non- insurance entities. IIB also partners with ICB and BFSB to promote captive insurance education. Four scholarships have been offered to Bahamians in the last two years to study towards an Associate in Captive Insurance. in the industry and has submitted a proposal to ICB for implementation of minimum education standards and insurance qualifications for insurance practitioners. IIB’s belief is that if client-facing employees are more knowledgeable about insurance and their products, they will be better able to advise clients and effectively deal with customers’ enquiries and claims. 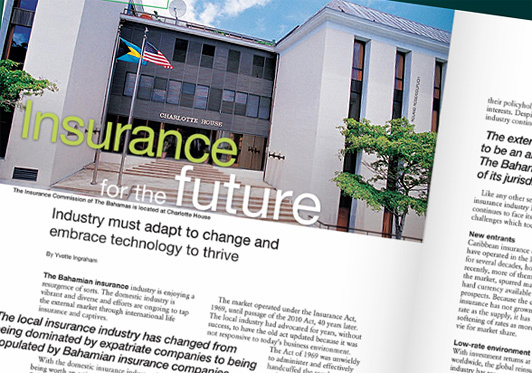 Despite the competitive environment and the challenges on the horizon, The Bahamas’ insurance industry is a strong market that will continue to thrive and grow as it has for over a century. Companies will be forced to adapt to a more technological world and find innovative ways to incorporate value-added services in order to create a competitive advantage. No doubt that they will rise to the challenge.